Cape Town's most famous theme park, Ratanga Junction is a must for all those up for a thrilling day out in the sun, with plenty of rides and activities to keep even the most active of children occupied. The park features gift shops and a food hall for weary riders, or those just looking to rest their legs for a while. There are almost constant shows on the food court stage to entertain youngsters, including magicians, animal shows, and dancers. The most popular ride by far is the Cobra, a snake-like roller coaster ride that flips the occupants round 360 degrees in an array of dips, corkscrews and hard turns. Other favourites include Monkey Falls, a water log ride which sees passengers drop down big waterfalls, and several smaller roller coasters. There are plenty of mellow rides designed for small children who aren't ready for the adrenalin-pumping stuff, but adults will be thrilled with the quality of rides they can enjoy. Almost all of the rides are included in the entry cost money, with the exception of things like the Slingshot, which carry individual charges. Parents who are not interested in participating can get a non-rider ticket which costs substantially less. There are plenty of snack kiosks dotted around the grounds. The queues can get frustratingly long so it is best to go on week days if possible. Note that Ratanga Junction only opens seasonally. Check whether the theme park is open on the official website before visiting to avoid disappointment. Opening times: Operational dates vary according to season, detailed schedules are available on the website. 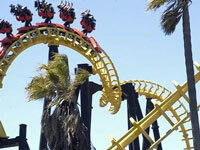 Ratanga tends to open mainly during South African school holidays.